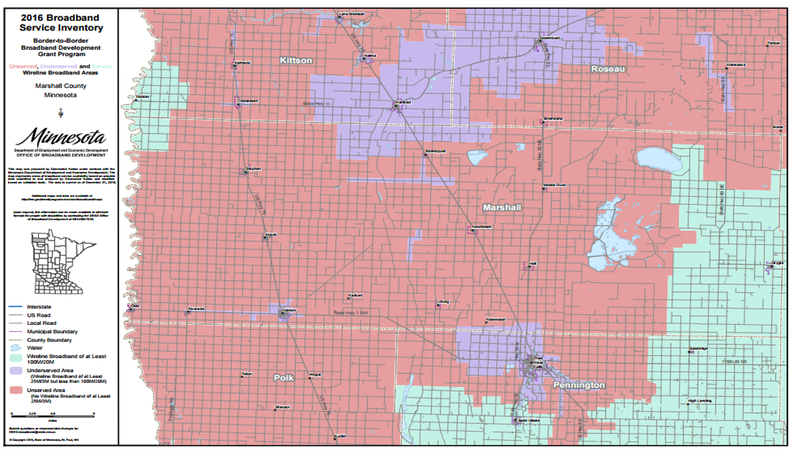 Marshall County is in bad shape when it comes to broadband coverage. Only 33 percent of the county has access to broadband speeds of 25/3 (Mbps down/up) and only 9 percent has access to speeds of 100/20, which is the Minnesota speed goal for 2016. But they have had some good news. Wikstrom Telephone Co. (with Beamco Inc.), Rural Alvarado – $43,481. The project will serve 11 unserved households and 1 unserved business in the Alvarado area, in a remote part of Marshall County. The telephone company and Beamco Inc., a local engineering and manufacturing company, are partnering to improve services in the area. Marshall County is also in line to receive $454,418 in CAF 2 funding to upgrade 535 locations. CAF 2 recipients are only required to upgrade to 10/1 access. Many may choose to upgrade to better speeds but there are no requirements. DDI score of 53.94 out of 100. This entry was posted in County Profiles 2017, MN, uncategorized by Ann Treacy. Bookmark the permalink.